‘Pet Advisor’ – a pet-friendly holiday website has released its’ annual top 10 list of dog holiday lodgings. I borrowed the link above from ‘The Christian Science Monitor’, which lists the article under the ‘Saving Money’ tag. I am not sure why the magazine chose to do that because the prices listed are, to put it bluntly, exorbitant beyond belief! This is even more so when you compare to the prices the same hotels charge for places without dogs. 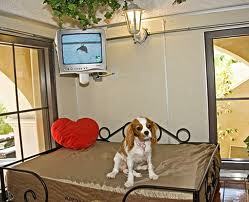 A dog friendly stay will set you back $100 a night approx. This is comparing to the no-dog equivalent at average $25 per person. Is this exploitation? Or do owners have a big ‘Kick Me’ sign printed on their heads? I would say, ditch the hotel and go camping with a tent instead. It’s more fun anyway.